Ted Hendricks was born in Guatemala, where his father worked for an airline company. The family moved to Hialeah, Florida, and Ted was a high school star. After Hialeah, the 6- 7, 218-pound Hendricks attended the University of Miami. As a defensive end during his three seasons with the Hurricanes, Ted received All-America recognition by totaling 327 tackles, a remarkable average of 109 tackles per season. 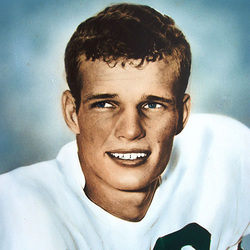 In 1968 Hendricks was fifth in the Heisman Trophy balloting even though he did not have the glamour of playing in the backfield. Actually, he spent most of his time in the backfield...the other team's. In his junior year he caused nine turnovers, by fumble recovery, stolen ball, pass interception or blocked kick. Against Pitt, Ted blocked a kick and recovered the ball 20 yards down-field. At Miami, he took the honors curriculum, majoring in math and minoring in psychology. Hendricks played pro football as a linebacker, 1969-83, with the Colts, Packers and Raiders, and was a member of four winning Super Bowl teams. In recognition of his outstanding career, he was inducted into the Pro Football Hall of Fame.